It seems as though every year or so I find myself painting birds and animals and doing series of each. I’m now involved in doing a series of raven art and crow paintings. There’s just something about a crows and raven that appeals to my dark side, and I make no attempts to try and lighten them up and portray them as jolly characters. It brings to mind an Edgar Allan Poe poem of the Raven, visions of October Halloween crows, and even the last three crows I saw picking away at a happy meal in the McDonald’s parking lot. They seem to be very resilient tough birds, perhaps giving birth to the saying a “Tough Old Crow! 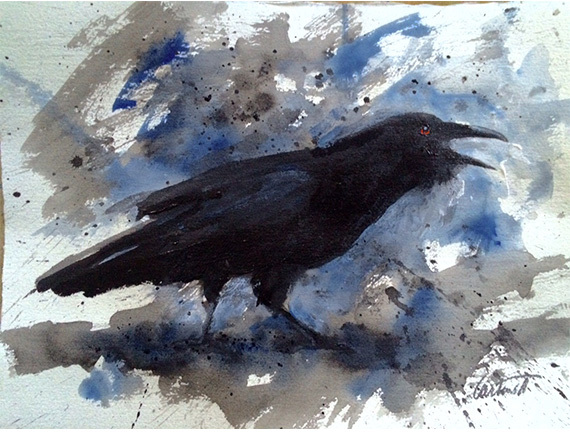 This is an 11″ x 15” acrylic on paper and the piece is titled: “Tell ’em” and the raven is one of the popular birds that I include in my bird paintings.